These are made with sonobe units. Not sonobe units like the ones by SONOBE Mitsunobu though; these are by Fuse. The diagram came from an amazon.co.jp preview: 花まり、布施知子 / Flower Globe, FUSE Tomoko. Each unit is made with 6×12 cm paper and assembling is very fun, as any sonobe! 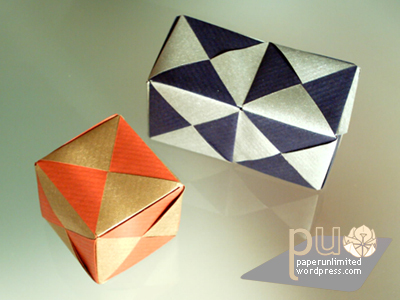 In the book these units are called めんこユニット/ menko unit; these units are introduced as basics to kusudama. Even if you don’t want to make a kusudama you can still enjoy these units by making geometric shapes/ polyhedra. These were folded from double faced kraft paper: blue on one side and silver on the other and red on one side and gold on the opposite. This entry was posted on 2007|02|21 at 20:16 and is filed under modular origami. You can follow any responses to this entry through the RSS 2.0 feed. You can leave a response, or trackback from your own site. I want to learn doing this menko! How can I do it?